Dr. Khan obtained his FCPS from The Bangladesh College of Physicians and Surgeons, Dhaka in 1999 and completed his FRCS from the Royal College of surgeons of Edinburgh, Scotland, UK in 2000. Then he took Fellowship training in Hepatico pancreaticobiliary Surgery from Sri Ganga Ram Hospital, India and underwent extensive training on Minimal Access surgery from India and France. 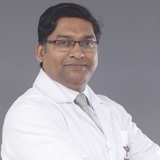 Dr Khan is a life member of “Society of Surgeons of Bangladesh“ and “Society Laparoscopic Surgeons of Bangladesh” and a Member of “The International Federation for the Surgery of Obesity and Metabolic Disorders” (IFSO) . Dr Khan is well involved in research in his discipline and has numerous of publications, both in reputed national and international journals. He has attended and organized several courses and workshops on Minimal Access Surgery. Dr Khan has more than 14 years of experience in the field of General and Laparoscopic surgeries including Minimal Access surgery, GI Surgery, Hepato-pancreato-biliary, colorectal, cancer and Breast surgeries. Before joining NMC hospital he was Associate Professor of surgery in Holy Family Red Crescent Hospital, Dhaka. His special area of Interest is in Advanced Laparoscopic, Bariatric and Metabolic surgeries.